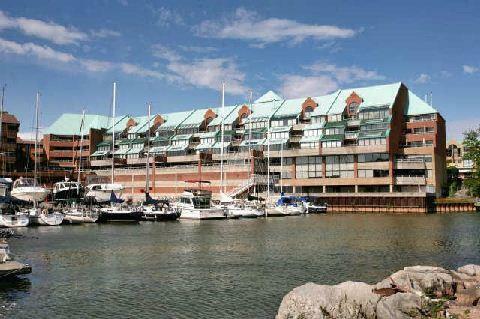 Stoneboats Quay is four storey waterfront condominium located at 100 Bronte Road in Oakville. There are 65 units overlooking Bronte Marina in the heart of Oakville's Bronte area. Some suites offer spectacular water views. Top floor suites have 2-storey loft floorplans. Suites range from 600 to 1900 sq.ft in size. There are one and two bedroom suites. Some two bedroom suites have den. Condo fees include common element maintenance and insurance, water. Amenities are party room, exercise room and sauna. Pets are not allowed in this building. Suites are sold with parking and locker.